Even though I can have dairy again I still don’t like milk. Unless I’m baking with it or making hot chocolate with it. Call me crazy, but I don’t ever remember being forced to drink milk as a child except for one time when I was being babysat with a friend by her grandparents. They were also forcing me to eat a sandwich heavy dressed with mayo. That was not a good day. With my continued dislike of milk in mind, I am still making smoothies and milkshakes with dairy-free milk. 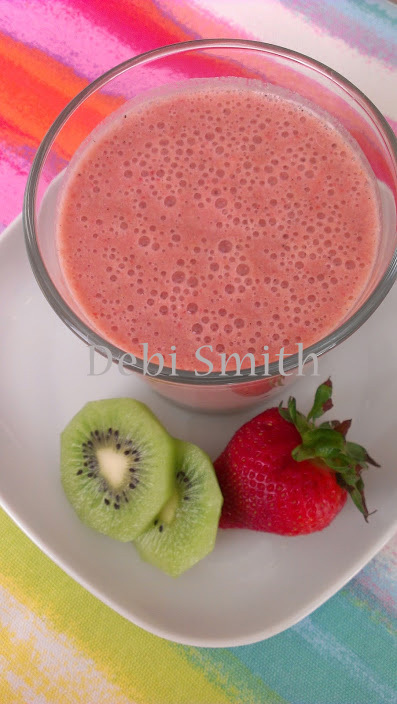 I started making this Strawberry Kiwi smoothie last summer when I had a lot of strawberries and kiwis in my grocery delivery. It was easy to prep both for freezing to use later. Two weeks ago, I used up the last of my frozen kiwis and strawberries then wondered, why haven’t I shared this with you? Oh, right. I’ve been writing. Well now you get this just in time for the strawberries and kiwis showing up in the market. You can use frozen strawberries from the frozen food section, but if you have the time to do it, I recommend buying fresh and freezing them yourself. When they are in season the prices go down, which makes it cheaper than buying a package of frozen berries. I normally buy my berries when they are on sale, making them even cheaper. If this is your first experience with one of my smoothie recipes, I do not make them for meal replacements. I do not use protein powders or other things you might find in a meal replacement smoothie/shake. I try to keep them limited to just what you will find in your pantry and refrigerator because I see them as a quick snack rather than a meal. I prefer to chew my food for breakfast, lunch, and dinner. If you don’t like hemp seeds or are allergic, just use your favorite dairy-free milk. Or regular milk if you swing that way. The maca root powder can be omitted, but I find that it gives the hemp milk a milky-er feel. Add water, hemp hearts, and maca root powder and blend until milky. Add remaining ingredients and blend until smooth. This entry was tagged dairy-free, egg-free, fresh fruit, frozen fruit, frozen kiwi, frozen strawberries, hemp hearts, nut-free option, soy-free, Strawberry Kiwi Smoothie, vegan option. Bookmark the permalink. Hi Debi, This recipe for smoothie sounds great! Do you think I will be able to find Hemp hearts and maca root powder in Minnesota? I’ve never used either one and have never heard of maca root powder. We have Whole Foods and Trader Joe’s, do you think either of them would have these items? OR can I substitute anything for them?